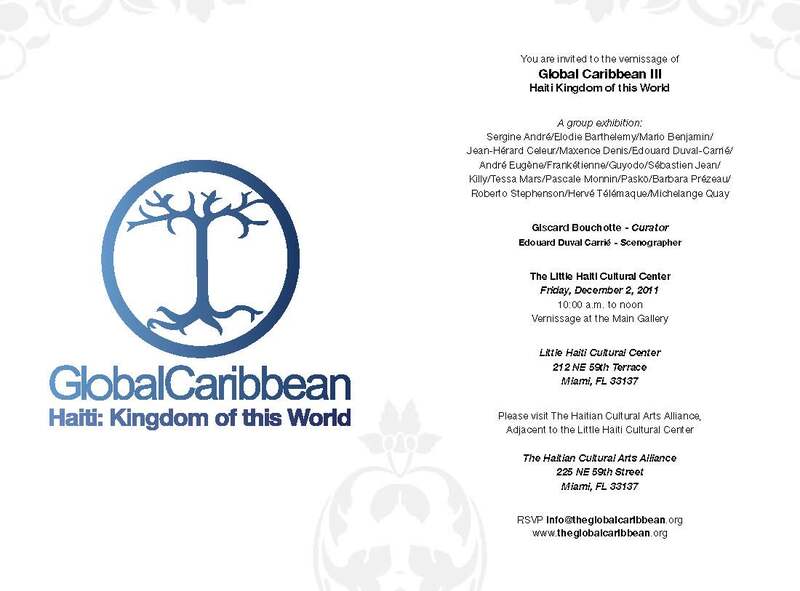 The exhibition, Haiti Kingdom of this World, arose from the need to draw up an inventory of the contemporary creativity in Haiti, and to show the work of artists who question daily the state of chaos reigning there. There are plastic artists, photographers, sculptors, painters, performers and video artists – all essential players of their time. 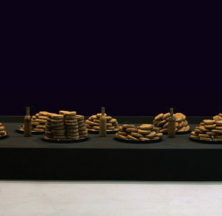 The exhibition is conceived as a laboratory of which they are the guardians. The exhibition is mainly concerned with recent and new works commissioned for the artists specifically for this exhibition, which testify to their creative vitality. 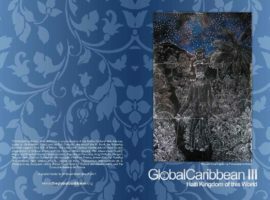 At the same time it challenges us to think about the difficulties these artists face in making their work known through travel and exchanges with the Caribbean and the rest of the world. Haiti Kingdom of this World seeks to go to the heart of this drama, to question the idea that misfortune is inevitable and to put forward another face of Haiti as seen through the eyes of its artists. The title of the exhibition is inspired by the novel of Alejo Carpentier: it offers a way of reconsidering the founding myths linked to Haiti and, without eulogizing them, attempts to redirect the chaos of Haiti and the possibilities it may contain. Alejo Carpentier’s real maravilloso (wonderful reality) long ago gave way to “wonderful chaos”. Frankétienne, with his literary and pictorial UFOs, has been creating an apocalyptic world for about forty years now. Mario Benjamin, on the other hand, inhabits time and tames space. 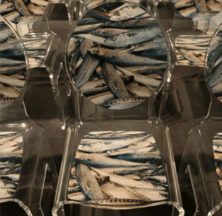 Maxence Denis, through his video-sculptures, pursues his reflections on the deluge of images that belong to our time. 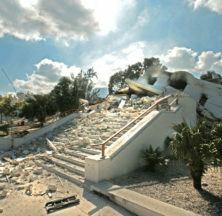 But how is it possible to continue creating after such a catastrophe and all the dramas that are added to it day by day? People like to evoke the “resilience” of the Haitian population, but if Haiti really wants to be the Phoenix rising from its ashes, it needs to take time into account. Alas, it is too long. A year after the earthquake, it is only via private initiatives that Haiti is beginning to look to the future. For the moment, only imagination and creativity are enabling Haitians to transcend their own boundaries and reconstruct themselves little by little. 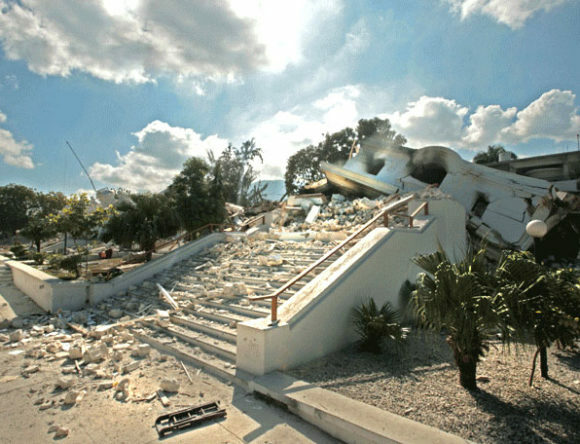 Before the earthquake, Haiti did not figure on the official circuits for contemporary art; today things are even more complex. In a country occupied by humanitarian aid agencies, the devastation paradoxically betrays any attempt to construct “professional” relationships. This exhibition goes beyond such an approach and relies on this “kingdom of creativity” to be the country’s most stunning advertisement. 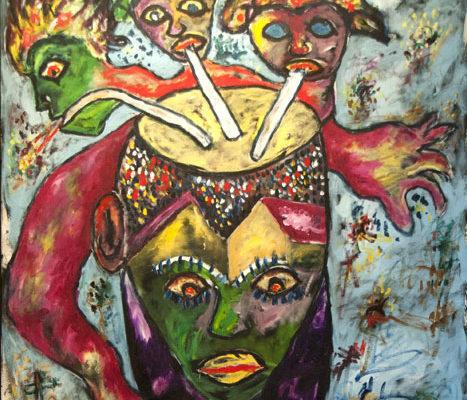 By showing its artists to the world, Haiti hopes to transform the charity it is being offered in exchange. 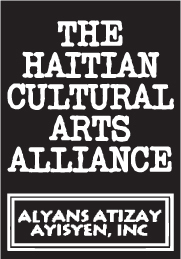 Despite the wide gap between the discourses stressing that Haiti will only emerge from the morass through its own culture, and the reality of the budget allocated to it, Haiti has a large concentration of artists and craftspeople from the “new region of the world”, the Caribbean – a potential which has inspired distinguished ambassadors and thinkers such as Aimé Césaire, Maryse Condé, Edouard Glissant and Graham Greene. Welcome to a Haiti which stands tall. A Haiti where life is reasserting its rights. Born in 1969 in Verrettes. Lives and works in Brussels. 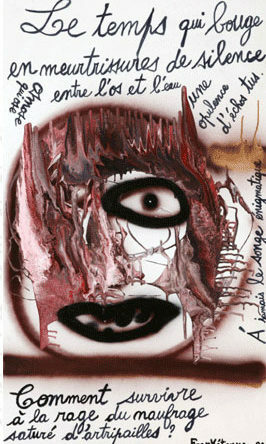 invited to the École Nationale des Beaux Arts in Paris from April through June, 1998. 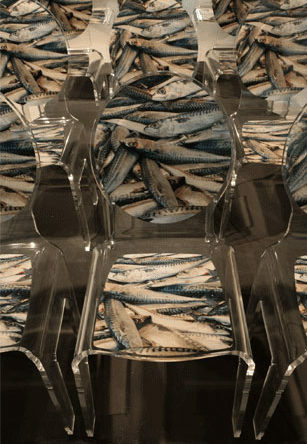 Since 1996, she has continued to exhibit in her own country as well as in Europe and the United States. Born in Colombia in 1965. Lives and works in Paris. After studying in France at the Beaux Arts de Paris, Élodie Barthélemy exhibited for the first time in Haiti when she was just 20 years old. 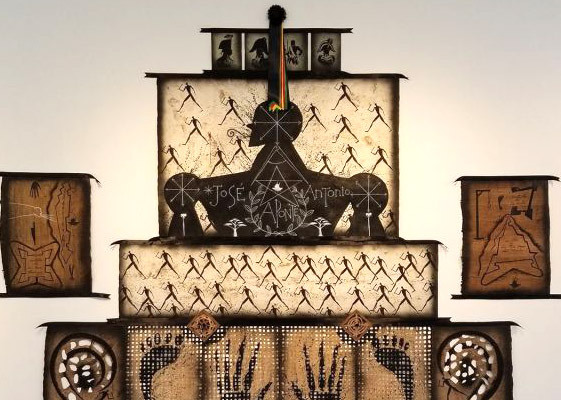 For “Haiti, Kingdom of This World,” she created a work inspired by different sources. She blended Gabriel García Márquez’s “One Hundred Years of Solitude,” French media reports on mudcakes used as food, and ancestral methods of mixing clay and straw to make walls. The result is cakes made of straw, lime and teeth that invite us to consider the eternal debt we will have towards the earth. Born in Port-au-Prince, Haiti, in 1964.Lives and works in Haiti. 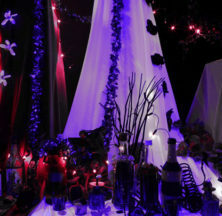 As a pioneer in informal art, installations and performances in Haiti, Mario Benjamin has accustomed his audience to being shaken up, sometimes to the breaking point. Mario Benjamin’s recent shows have been directed at space. He creates an environment on a human scale. 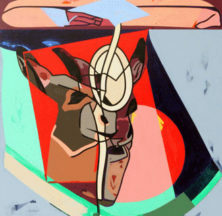 The art draws close to the “subject/spectator” and ceases to be an object. He was invited to the São Paulo, Johannesburg, Santo Domingo and Havana biennials. 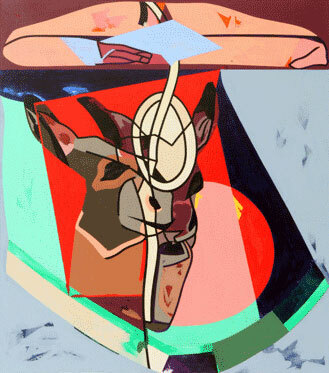 He also participated in shows at the MoCA (Museum of Contemporary Art) and the Brooklyn Museum in New York. 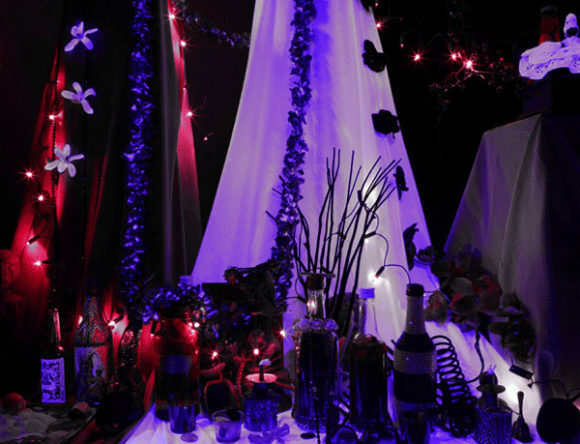 One of Mario Benjamin’s latest creations is his permanent installation, in memory of those who disappeared in the earthquake, at Digicel in Port-au-Prince. Born in Port-au-Prince, Haiti, in 1966. Lives and works in Port-au-Prince. 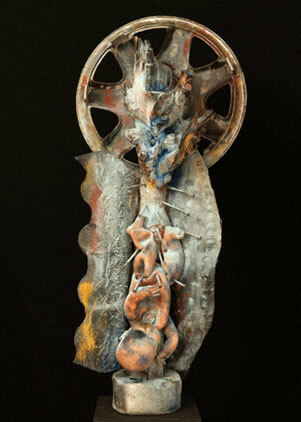 “My sculptural work is a collage that crosses through the abstract and the representative. It is an assemblage of objects that I cut in wood, combined with found materials that surround me, like engine tubing, television sets, tires, hubcaps, and rejected construction wood (…). My most recent work, entitled “Zonbi,” includes a series of sculptures (…). The real meaning of the “kreyol” term, in Creole, simply means an individual who is under someone else’s influence. In the case of this series, I use it to represent the common point of view that large artistic institutions have of the artists in Third World countries. Born in Haiti in 1968. Lives and works in Dakar, Senegal. Island” at the Brooklyn Museum, in the “Forum AfricAmericA” in Haiti, and the Dakar Biennial in 2010, where he won a Fondation Blachère prize. Edouard Duval Carrie was born in Port-au-Prince. Haiti and spent his late childhood years in Puerto Rico where his family had fled to escape the oppression of the Duvalier regime. He was educated at the University of Loyola in Montreal, Quebec and at the École Nationale Supérieure de Beaux Arts in Paris. 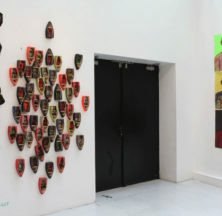 Since his first exhibit in 1978 at the Centre d’Art in Port-au-Prince he has had solo exhibitions throughout Europe, Africa, Latin America and the Caribbean, Africa and the United States, and has participated in numerous group exhibitions including the Venice, Beijing, Sao Paolo, and Havana Biennials. 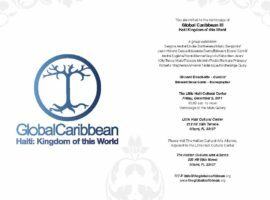 He has recently curated several shows in particular a series of Caribbean exhibits in association with l’Institut Francais. He creates his art in a fascinating studio in the Little Haiti neighborhood of Miami, which gives a sense of history and community, not just for himself or even just for the Haitian Diaspora. 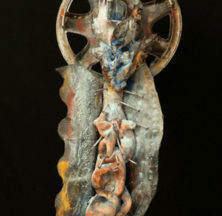 His paintings, works in acrylic, installations, resin sculptures, works on paper associate African fables, Haitian classical mythology, and contemporary world events. 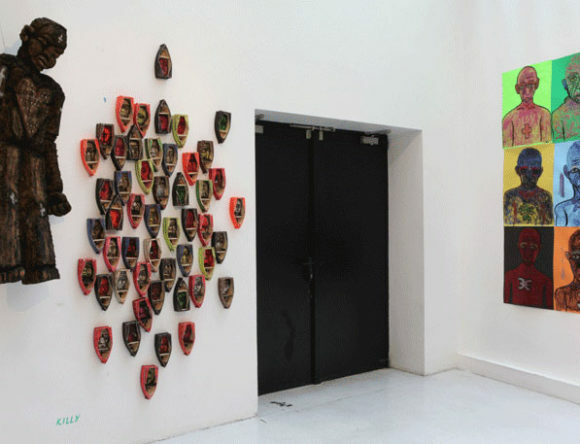 His works also reflect on the complexity of the French heritage and post-colonial African patrimony in Haiti. 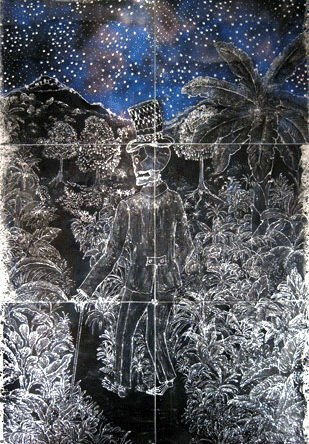 Most notable are his interpretations of the migration of vodou, a religion in constant flux, towards distant shores. Duval Carrie plays a part in a global, contemporary art network that stretches from Cologne to Benin. 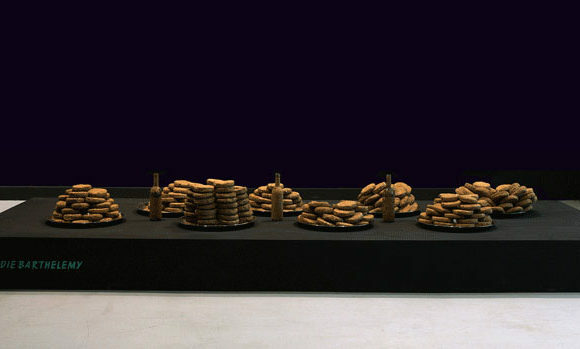 He is artist-in-residence at Brown University and Duke University and has received a fellowship at Duke University. Born in Port-au-Prince, Haiti, in 1959. Lives and works in Port-au-Prince. André Eugène has worked as a mason and influenced by the creative energy of his surroundings, he learned traditional wood sculpting. 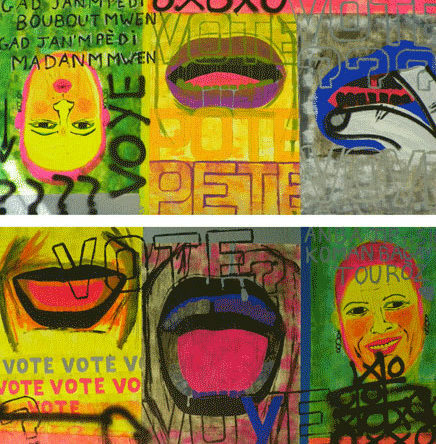 Inspired by Haitian artists like Nasson, his work is figurative and imbued with an audacious conception of irony, sexuality and humour. Since 1998 he has participated in many collective shows in Haiti, the USA and Europe. “Usually it’s always the bourgeoisie who own galleries. But I’d like to have one that would not be just a gallery but more like a museum. That’s the reason I named my studio and my followers E Pluribus Unum Art Museum.” with which he did video performances in the Parisian underground milieu until 2004. 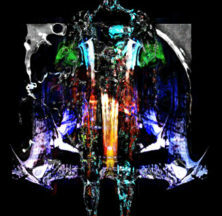 He then created video sculptures which he has presented around the world. 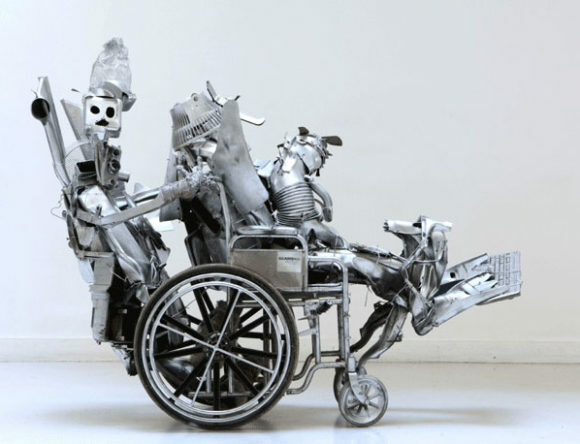 In particular, he participated in the 51st Venice Biennial, in “Landings” in Mexico in 2006, in “Infinite Island” at the Brooklyn Museum, in the “Forum AfricAmericA” in Haiti, and the Dakar Biennial in 2010, where he won a Fondation Blachère prize. Born in Haiti on April 12, 1936. Lives and works in Haiti. Born in Port-au-Prince, Haiti, in 1973. Lives and works in Port-au-Prince. professional soccer player until he was 25. 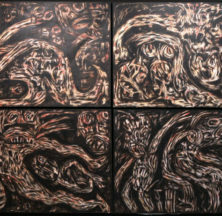 In 1989, Guyodo showed his work for the first time at Sent Kiltirel Afrika Amerika, in Port-au-Prince. In 2006, he was one of the artists selected by the commissioners of Liverpool’s International Slavery Museum, who commissioned a monumental piece from him (“Freedom Sculpture”) in commemoration of the 200th anniversary of the abolition of slavery. Born in Thomassin, Haiti, in 1980. Lives and works in Haiti. grant and is in residence at the Recollets Monastery in Paris. 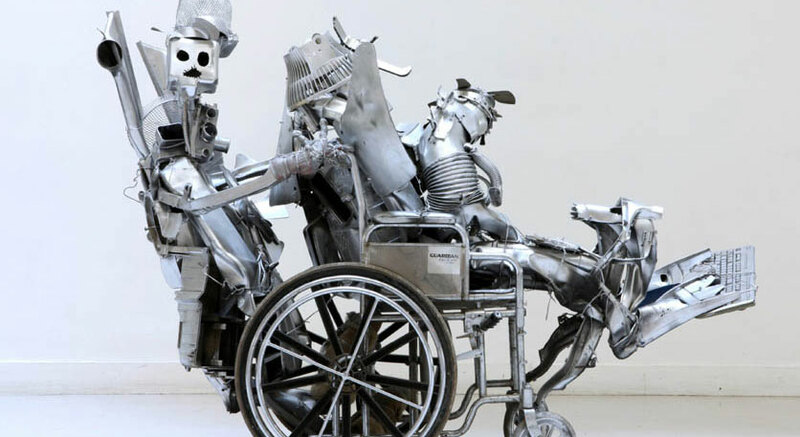 He has participated in various shows, including: “Arts America” in Miami, Florida, organized by Marassa Gallery, “Saint-Soleil – Malraux” in Pétion-Ville organised by the Institut Français and the French Embassy. Born in Giraudeau, a suburb of Pétion-Ville, Haiti, in 1966. Lives and works in Montreal. 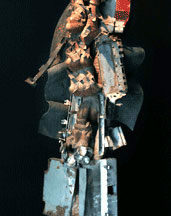 Killy began work as an artisan, and later he learned sculpture. 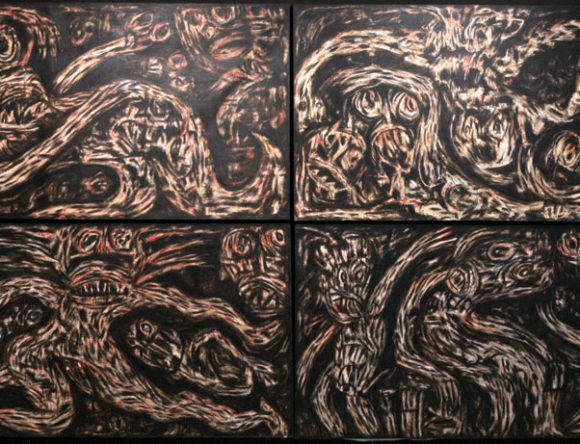 In 2004 Killy emigrated to Montreal, and there he produced a baroque and expressive imagery that gave his pieces a rare power. He continued his training in engraving and lithography until October 2005, when a serious work accident reduced the use of his right hand, without however stymying his creative power. The “Grandir et Mourir” show, organized in February 2008 at Montréal Arts Interculturels (MAI) was his first one-man show in Quebec. 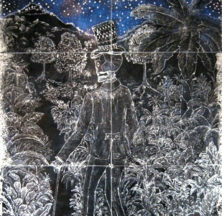 He aroused the public’s interest and received the stamp of approval of Montreal’s critics, who saw in him an “impulsive creator.” In 2009, he presented his works at the Monnin Gallery in Haiti. Born in Port-au-Prince, Haiti, in 1985. Lives and works in Pétion-Ville, Haiti. After attending university in France, Tessa Mars returned to Haiti and worked for the Fondation AfricAméricA as assistant project coordinator. Paint is her preferred medium, and her work centres on the concept of identity. 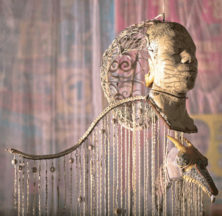 In 2008 she displayed her work at the 5th Transcultural Forum in Port-au-Prince. “Tessa Price Mars returned to her country with academic baggage acquired in a Nordic context. 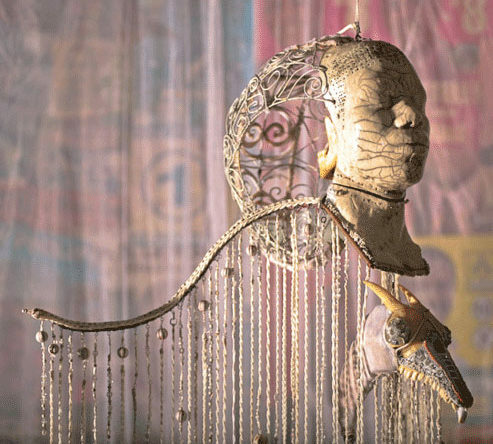 In contact with folk artists, self-taught members ofthe Fondation AfricaméricA, she questioned what she had learned and developed a pictorial style, free, broad and often violent.” Barbara Prézeau. Born in Port-au-Prince, Haiti in 1974. Lives and works in Port-au-Prince. After a stint in Europe, Pascale Monnin returned to her father and sister in Haiti, and with them took over the gallery founded by her grandfather. “From sculptures by Nasson to paintings by Zéphirin and Mario Benjamin, the Monnins develop one of the richest collections of Haitian art in the last fifty years. 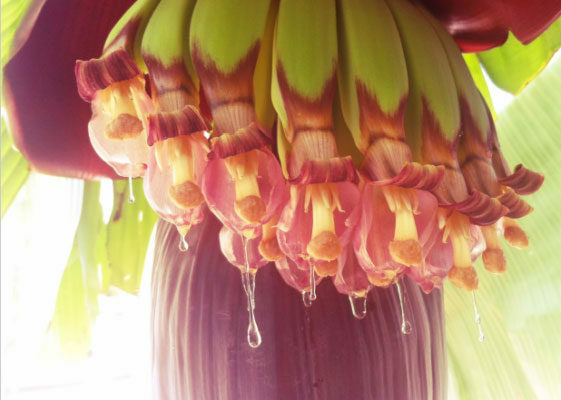 Pascale Monnin (…) didn’t wait for the country to get back on its feet. She knows that the paintings she exhibits contribute to the construction under way.” (Arnaud Robert). 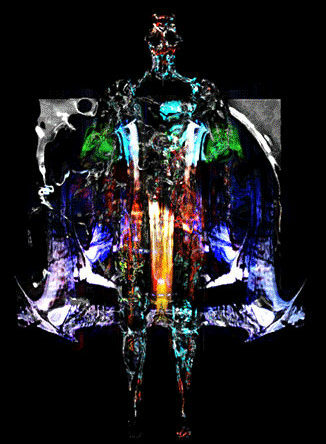 Since 1992, Pascale Monnin’s works have been shown worldwide (currently in Los Angeles). Born in Pétion-Ville, Haiti, in 1974. Has lived and worked in Carcassonne, France, since 2004. 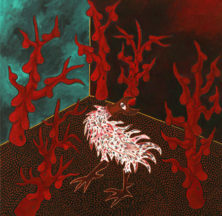 From 1994 to 1996, Paskö studied drawing and painting at the art studios of Holy Trinity School. Then he frequented the studios of Tiga. In 2000, he took part in the linocut workshop of American, on the occasion of the first Forum Multiculturel d’Art Contemporain, organised by the Fondation AfricAmericA. In 2002, he worked on ceramics at Lissa Jeannot’s studio. He exhibited his works for the first time as an invited artist at the Festival Saint-Soleil in Soissons-La-Montagne, in September 1996. 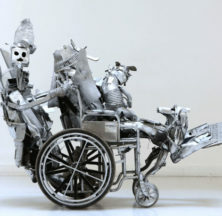 Since then his work has been shown in Haiti, Cuba, the Dominican Republic, France, Canada, Norway and the United States. Born in Port-au-Prince, Haiti, in 1965. Lives and works in Port-au-Prince. Land Art. 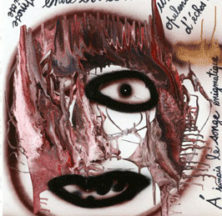 In 1999, she did “Choses.” In 2004, she did a project in the gardens of the École des Beaux Arts of La Réunion with “Signes, Mémoires;” and in 2005, she did “Soie, fleurs et mistral” in Marseille. Born January 5, 1974, in the United States.Lives and works in Paris. In 1994, Michelange Quay got his degree in Cinema from New York University, and a degree in anthropology from the University of Miami. Three years later he received a degree in film production from the prestigious Tisch School of the Arts. In 2002. He lived in Paris, at the Cinéfondation du Festival de Cannes where he began writing his full-length feature “Mange ceci est mon corps.” In 2004 he made “L’Evangile du cochon créole,” an 18-minute short that was presented in official competition at the Cannes Film Festival. He also received the prize for best short at the Lucarno, Stockholm, Milan, Rio de Janeiro, Sao Paolo and Turin festivals and at the Tokyo Con Can Film festival. Born in Rome, Italy, in 1964. Lives and works in Haiti. The son of a Haitian father and an Italian mother, Roberto Stephenson has lived in Rome, Aleppo, Amman, New York, Ahmedabad and London and currently lives in Port-au-Prince, Haiti. After studying engineering and graphic design, he turned to architectural photography. His photos were shown at the Caribbean Biennial in Santo Domingo in 2001, where he won the gold medal, in Martinique at the Rencontres Photographiques en Caraïbe (2001), in Havana at the 5th International Digital Art Show, in Oslo at the House of Art Museum in 2003, and at the 5th Rencontres de la Photographie Africaine in Bamako, where he won the European Community prize. Born in Haiti in 1937. Lives and works in Paris.